LONDON — A British energy entrepreneur and one-time Formula 1 racing team owner is entering the race to build new inter-city “flying taxi” services that tap recent aerospace advances while steering clear of more fanciful blue-sky visions touted by tech-focused rivals. Stephen Fitzpatrick, founder of Ovo Energy, an upstart challenger to the UK’s big six electric utilities, said his new venture will apply lessons from F1 racing to build electric Vertical Takeoff and Landing (eVTOL) aircraft. Vertical Aerospace, as his self-funded, Bristol-based flying company is known, aims to offer short-haul, inter-city flights carrying multiple passengers using piloted aircraft within four years, Fitzpatrick said. Since its inception in 2016, the firm has hired 28 veteran aerospace and technical experts from Airbus, Boeing, Rolls-Royce, Martin Jetpack and GE with extensive experience building certified commercial aircraft. Unlike the majority of flying-car projects from tech, aerospace and automotive entrepreneurs that have captured the popular imagination by seeking to turn aircraft into pilotless, autonomous vehicles, Vertical believes it can overcome regulatory and safety concerns by delivering piloted, fixed-wing aircraft that capitalize on incremental, existing innovations. Vertical is looking to target some of the most congested air corridors in the world with aircraft that don’t require runways but also have enough heft to travel up to 500 miles (800 km), Fitzpatrick said in an interview. “We are investing in all the technology evolution taking place in aerospace but we are trying to apply that to something that’s real world and is possible to execute four years out,” the Vertical Aerospace founder and chief executive said. Competitors working toward launching autonomous flying cars early in the next decade range from aerospace giant Airbus to Uber, which is developing an intra-city flying taxi fleet, Volocopter, which is testing drone taxis that resemble a small helicopter powered by 18 rotors, and AeroMobil, with a stretch-limousine concept that can turn into a fixed-wing aircraft. Several of these projects envision services that can be ordered up, on-demand, via smartphones, from skyhubs in city centers. 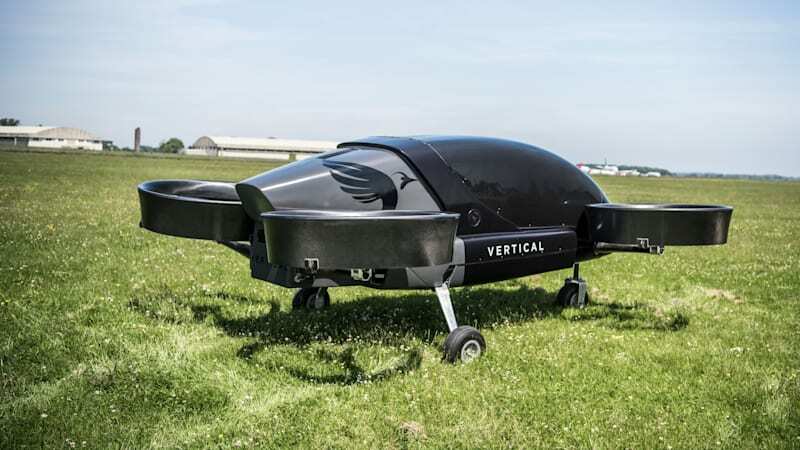 Vertical said it had conducted a test flight of an unmanned, single-passenger vertical takeoff prototype at an airport in Gloucestershire in western England in June after it was granted flight permission by the UK’s Civil Aviation Authority (CAA). The black passenger pod with four rosters set the stage for more ambitious work. It is gearing up to produce a fixed-wing, piloted version of its vertical takeoff aircraft capable of carrying multiple passengers. It will work with regulators to win certification in the first stage of the air taxi project through 2022, it said. In a later stage, Vertical will seek to extend the aircraft’s range, introduce elements of autonomous flight and expand the number of chartered routes it can serve. Belfast-born Fitzpatrick prides himself on developing business ideas in areas where, at the outset, he has zero technical background. He said he spent years studying energy markets before launching his energy utility firm, Ovo, in 2009. It now counts around 680,000 customers, or 2.5 percent of the UK domestic retail energy market, and employs 1,200 staff. His first brush with hardware and physical product engineering came when he was a short-term owner of flagging Formula 1 team Manor Racing. Fitzpatrick said it dawned on him that many racing car advances also applied to aircraft, from high-powered electric batteries to hybrid power trains, lighter structural materials, like carbon fiber and, of course, aerodynamic design. “The technology we were using in Formula 1 was just too high-spec to be applied to the challenges of the typical road car,” Fitzpatrick said. “What you can get from an F1 engine has more power density per kilo than a jet turbine,” he said.